The early childhood learning center was under renovation when it received a truckload of material - later deemed non-hazardous - that it didn't request, officials say. The Heights School, an early childhood learning center in the Roslyn Public Schools system, was in the midst of a multimillion-dollar renovation last summer when it was unwittingly brought into an illegal dumping scheme. The campus, which serves pre-kindergarten to first-grade students, received a truckload of recycled concrete aggregate, a type of processed construction debris. The only problem, according to prosecutors and school officials: The renovations — including a new main entrance, library and heating system — didn’t call for any of that material. As part of a 131-count indictment returned last November, the Suffolk County district attorney’s office alleges that the material, though later deemed nontoxic, constituted solid waste regulated by the state Department of Environmental Conservation. In connection with the incident, a waste industry executive, Frank Rotondo, and a company he is tied to, Modern Leasing Inc. (aka Dumpmasters), face charges of felony criminal mischief and misdemeanor operation of a solid waste management facility without a permit. Authorities say they arranged for delivery of the materials from a Queens waste transfer station to the school. James Williams, the truck driver who allegedly dumped the waste on June 11, 2018, faces misdemeanor charges of criminal facilitation and transporting solid waste without authorization. Like the others charged in the larger alleged dumping scheme, dubbed “Operation Pay Dirt,” that defiled numerous Long Island residential and commercial properties, the defendants have pleaded not guilty. Attorneys for Rotondo and Modern Leasing didn’t respond to requests for comment. But Williams’ lawyer said that his client was merely following an instruction to bring materials from one location to another, with no knowledge that it couldn’t be dropped there. The materials dumped at the school, according to the Pay Dirt indictment, came from the Durante Bros Construction Corp. yard in Flushing. That company faces numerous counts connected to providing the solid waste dumped at a half-dozen other sites but, for reasons prosecutors didn’t detail, was not charged specifically in the case of the material delivered to the Heights School. At several of the other properties in the scheme, prosecutors allege the solid waste from Durante Bros was represented by middlemen as “clean fill” dirt but contained hazardous substances, including diesel and the toxic pesticide components dieldrin and aldrin. The company and its operators, who were charged individually with misdemeanor conspiracy, have pleaded not guilty. Even though the aggregate brought to the Heights School, in contrast to other sites, tested negative for any hazardous substances, the discovery prompted the district to mobilize for the worst-case scenario. 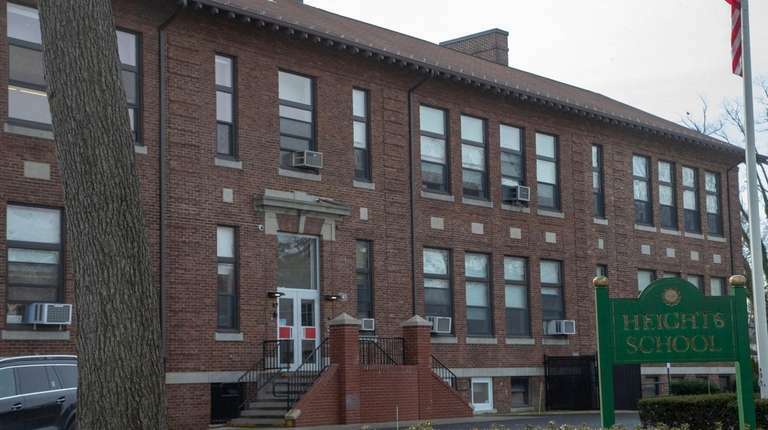 Officials covered the material with a tarp, cordoned off the area, placed guards at the site to limit access and hired an independent environmental firm to conduct tests, said Roslyn Schools Superintendent Allison Brown. Weeks after the material was delivered, the DEC told the district that it could be removed without remediation. The district’s construction manager for the Heights School renovation directed the responsible contractor — whom Brown did not identify — to remove the material under DEC supervision. “All costs associated with this matter, including testing, are the responsibility of the general contractor,” Brown wrote in an email. The superintendent didn’t respond to further questions, including the cost of the response, why the material was brought to the school and how the district’s general contractor came to work with companies charged in a criminal dumping scheme. The incident appeared to get little public mention at the school board meetings that immediately followed, according to available minutes. At the first meeting after the incident, however, Brown had provided a report to the board about summer construction projects, including at the Roslyn Heights campus, that were part of a districtwide $40 million capital plan, according to minutes of the meeting posted on the district's website.